Tue., June 26, 2018, 9:20 a.m.
BATTLE GROUND, Wash. – A tractor-trailer hauling a load of live chickens crashed on state Highway 502 on Monday afternoon, spilling hundreds of birds and delaying traffic. The crash was reported around 3:15 p.m. near the intersection of Northeast 29th Avenue and Highway 502, also known as Northeast 219th Street, west of Battle Ground. Washington State Patrol Trooper Will Finn said the driver was unhurt. 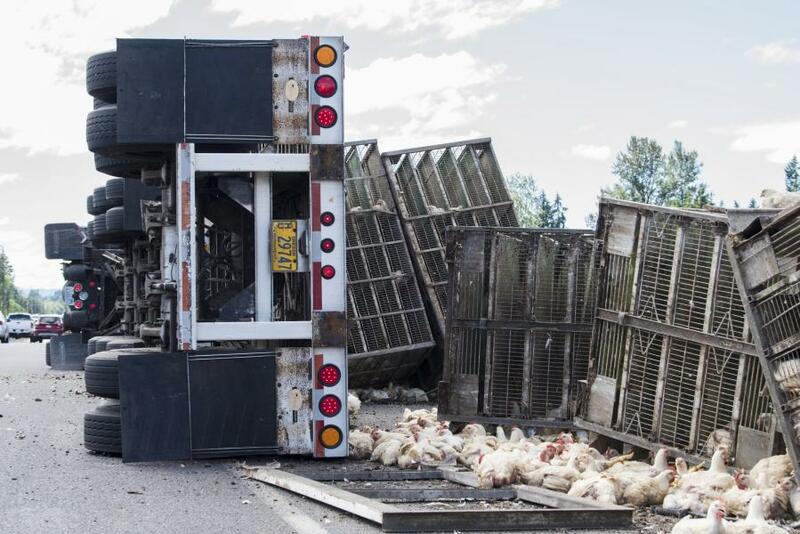 “The driver of this combination semi truck and trailer combination loaded with chickens performed an illegal U-turn,” Finn said. It was only the driver’s second time making the route, picking up the birds from a local farm to deliver to the Foster Farms chicken processing plant in Kelso. He had completed the U-turn successfully the first time, Finn said. The problem, Finn said, is that the intersection is not designed for commercial vehicles to make U-turns there. There is an intersection at Northeast 92nd Avenue specifically designed for large vehicle U-turns. This time, the driver couldn’t navigate the turn, and the truck rolled onto its side. Finn estimated there were more than 5,000 chickens in small cages aboard the truck, but it wasn’t clear how many had died. Many of the white-feathered birds spilled from their cages, but most stayed near the wreckage of the truck. Finn said workers from Foster Farms arrived to help clean things up. They were sorting the live birds from the dead ones, and getting them all packed up, Finn said. The crash blocked westbound lanes as crews worked to clean up the roadway. The Washington State Department of Transportation announced the road was clear around 8 p.m.
Word of the accident quickly spread on social media and the internet. About 6:15 p.m., sheriff’s deputies were called to the scene to help preserve the peace and control traffic as animal activists arrived to protest. A woman, one of the roughly 30 activists who arrived, allegedly picked up a chicken and refused to return it to a Foster Farms employee, Finn said. After she continued to refuse to relinquish the chicken, Finn said she was arrested, but not booked. Finn said troopers were forwarding recommended charges of third-degree theft and failure to follow a peace officer’s instructions. Finn said the driver was ticketed for making an improper U-turn in a commercial vehicle. Published: June 26, 2018, 9:20 a.m.